Goals help you track your progress or stick within a specific budget so you can keep on top of things and be more productive. Each time you log an entry, your goals will be automatically updated with your latest progress. Head to the Goals tab and click the ‘Add goal’ button at the top right. Name your goal, set it as a target or budget and use the filters to select what you want to assign it to. To make a goal that reflects the ideal time to spend for a specific contact, project or task set the goal to ‘target’ - Target goals are considered good to exceed. To make a goal to keep under a certain total (eg: a fixed price project), set your goal as a ‘budget’ - this will be considered bad to exceed. 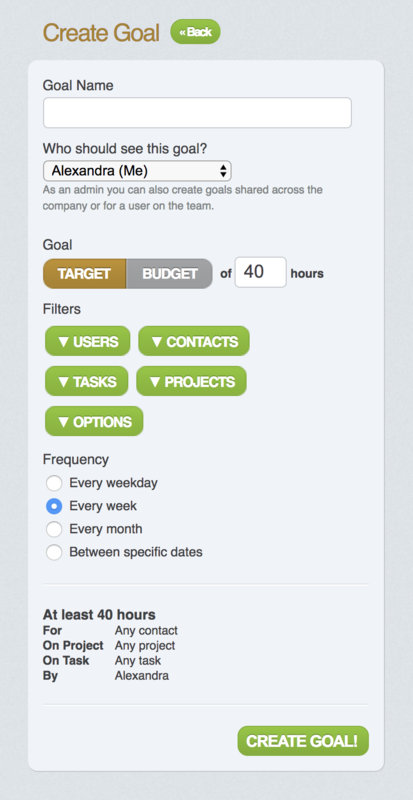 You can select filtering options for your goals to assign them to different users, contacts, projects and tasks. You can also use the ‘options’ button to have the goals monitor billable/unbillable time.